1. 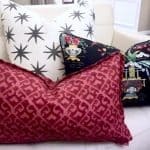 Greenery, especially at this time of year, brings freshness indoors, where we are typically spending more time. 2. Plants clean the air. I picked up these bromeliads at the grocery store. They make an easy dining room centerpiece for every day. 3. Indoor plants are really on trend. In some cases, the more the merrier (trés boho)… in our daughter’s apartment. 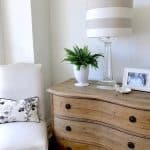 (real philodendron on the lampstand, faux leaves in the wood vase, air plant in the glass hand, real mini cactus). All of these plants are durable. 1. Sometimes they are difficult to keep alive… that is actually sort of a truth, right? I refuse to buy this maidenhair ANYMORE. See how it’s already dying after three weeks? 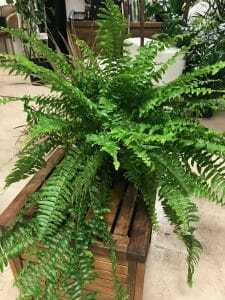 Buy a Boston fern instead as it will last longer and be less finicky. 2. 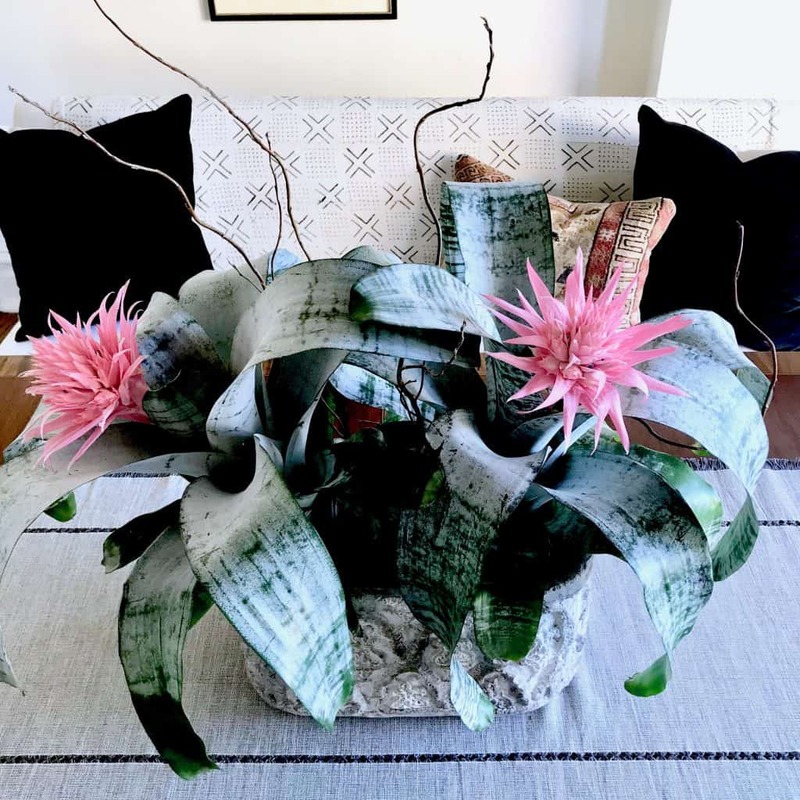 Mixing in faux with real plants (or flowers) makes them appear more authentic. 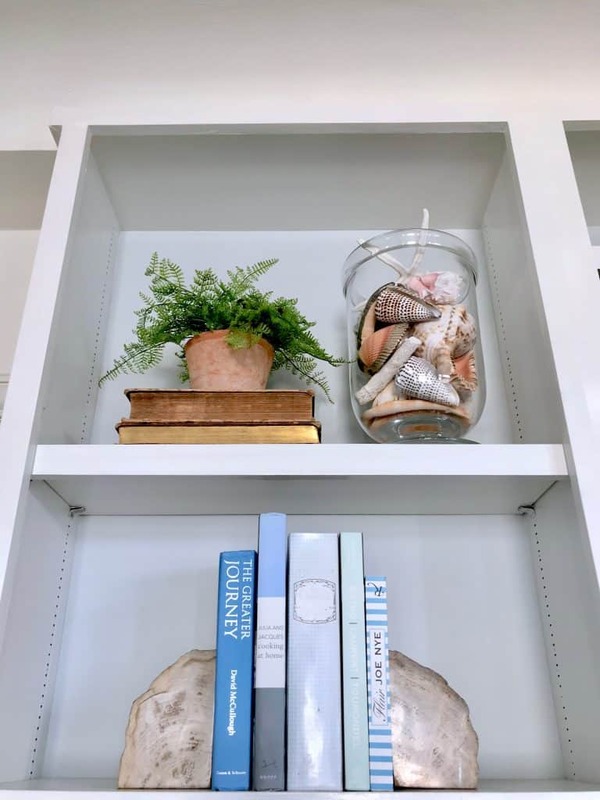 That the top shelf is a little hard to water so the faux fern adds some freshness. 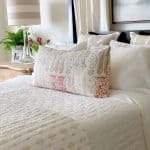 I just bought it at Pottery Barn but can’t find it on their website now…it’s in the store though. Here are some plants that will give your home a nice little lift and make it look current. I have a ZZ plant like the one on the left…and forget/neglect it and it’s still alive! These new snake plants in my office have me feeling happy! I put this moss in the base of all my house plants and I think it helps the soil stay moist (and looks good, too). See the new growth on this fiddle leaf fig tree? It’s been healthy for almost five years. All I can say is I water it once a week and it gets a lot of indirect sunlight (placement is key). And this plant polish works so well on house plants. This Faux tree might work for you if you don’t have the right lighting. I like the taller one. I’ve had this dracaena plant for several years, too. And there is not much sunlight in our bedroom. There is that moss again. There you have it!! Brighten your life with some plants! 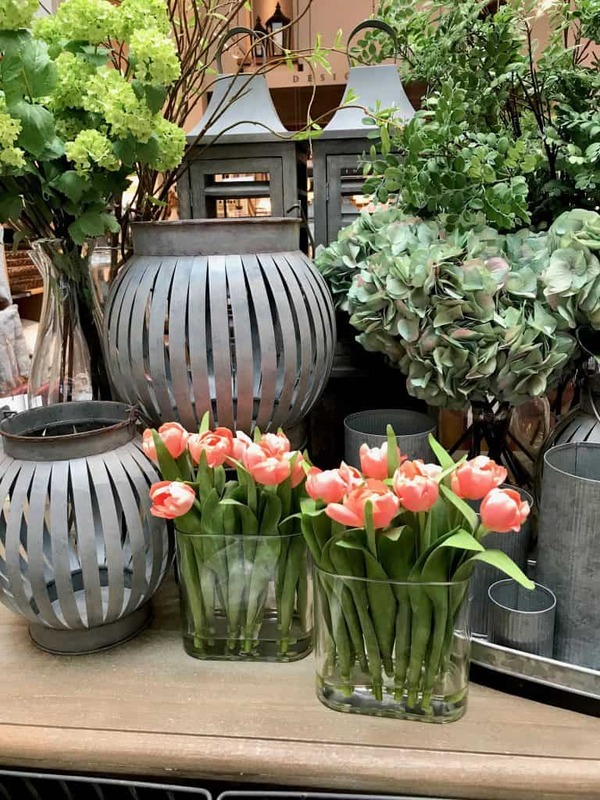 I saw these silk flowers in my local Pottery Barn this past weekend…pretty fun. Do you have any house plants that you swear by? I’d love to know!!! Ha! 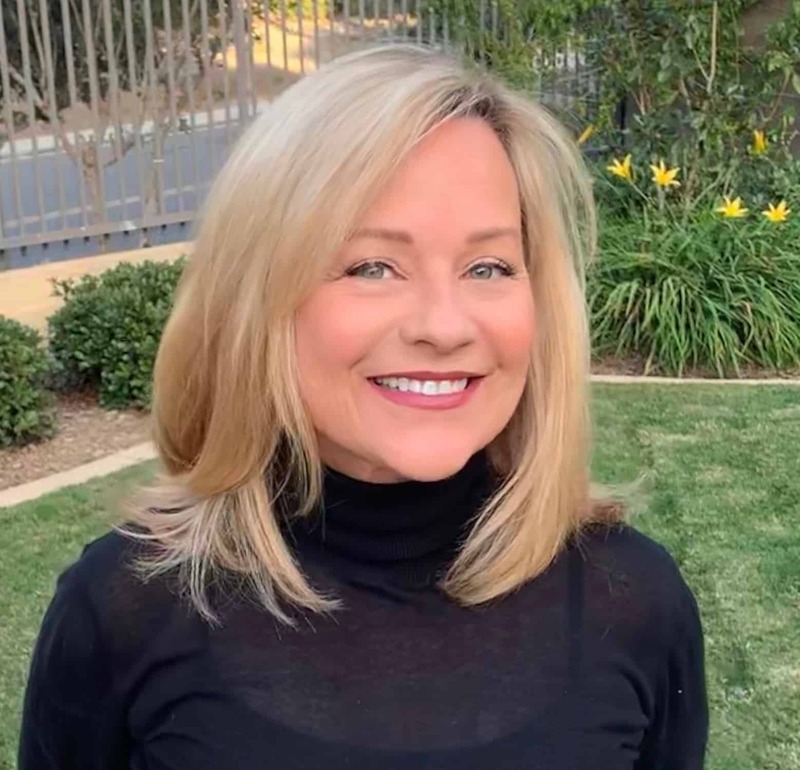 Lyn, the stager might have felt you were “stepping on her toes.” She has her own vision. Anyway, I am sure those beautiful plants look great in your home. I have a tip for artificial plants…spray them with Static Guard and the dust doesn’t cling to them. You can also spray your ceiling fans and you won’t need to dust them as often. What an excellent idea, Nancy! Thanks. My favorite is orchid which needs little water – I water every 2 weeks or when dry with weak orchid food. They will last more than 3 months in bloom. Thanks, Donna. I usually put a couple of ice cubes at the base in mine every week… but your idea sounds easier, especially if I am going to be away. Sanseveria–aka “mother-in-law’s tongue”–is very hardy and lives for decades. Orchids also are pretty easy. 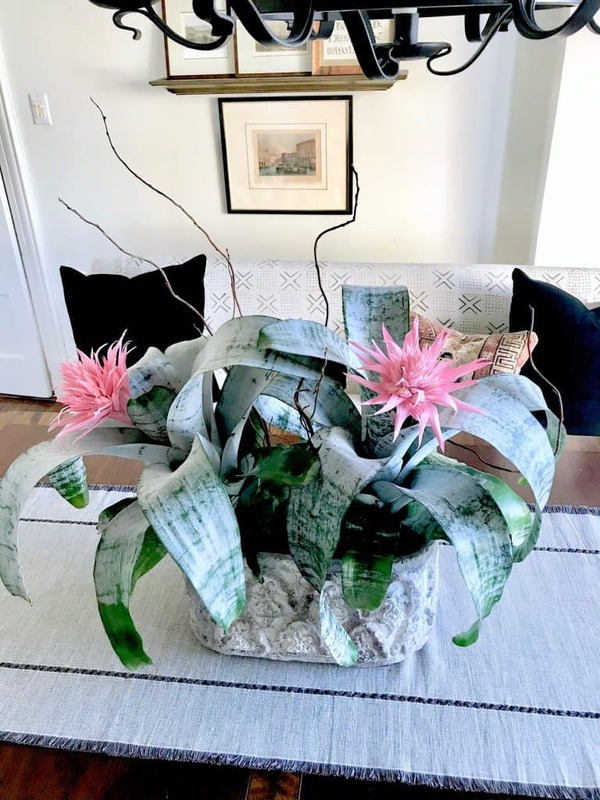 I had 3 “snake plants/mother-in-laws tongue in our previous home and because I was having such a tough time with my mother-in-law, I thought I should get rid of them…symbolically ridding the negative energy…I know a little extreme, but I was desperate;)! However, they are one of my favourite plants, extremely good at clearing toxins, and are visually interesting so now I have them back in our home and another 5 in our Naples home: hee hee. 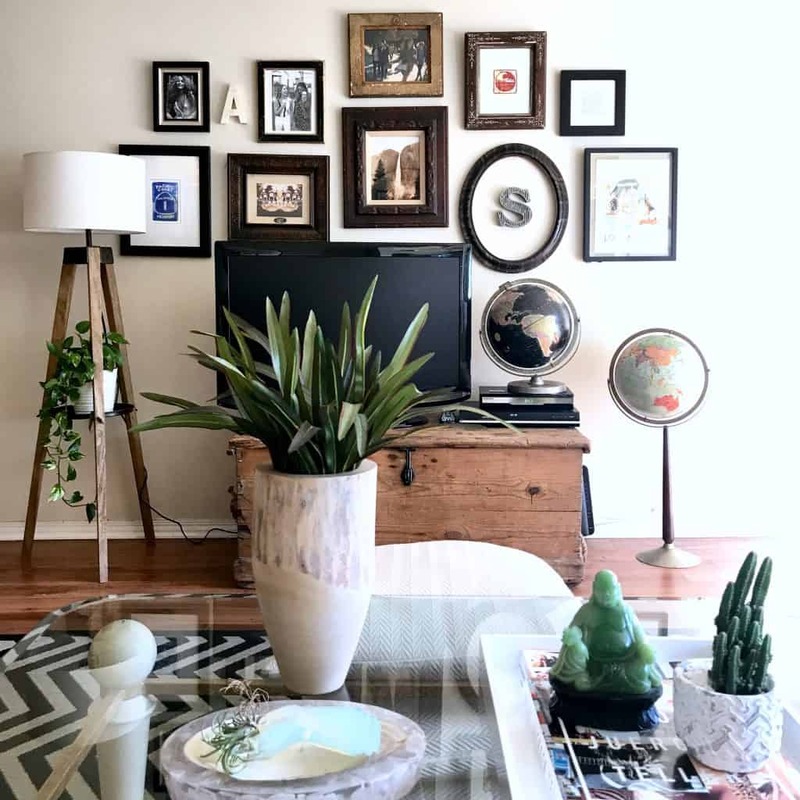 Pothos is also an oldie but a goodie which your daughter has in her apartment. Great post! Bird nest ferns and Rabbit foot ferns are extremely easy to go for me. I will check those out, Cathy! I love to have lots of real plants in my home. I have had excellent luck with any kind of dracaena. The seem to really thrive in my home with little care, and there are so many different kinds. If the tips go brown on some leaves, I just snip them off in a point and you don’t even notice. I also like to take them outside a couple of times a year and hose them off. I also recommend Home Depot for healthy house plants, price, and they guarantee them. Home Depot IS a good source. I wish I had one closer to me but I can make the effort to go there! Good point about trimming the leaves, Madeline! Hi Mary Ann! Would love to add some of these around my barren rooms 🙂 Are the real ones Boston Terrier safety spproved? I have a ficus tree that is at least 40 years old! It goes outside every spring and in the fall I give it a good haircut and bring it in…..Every other year I pull it out of the pot, cut the roots back & knock off old dirt….then replant……It knows the drill and remains healthy & beautiful! Cat owners should be wary of house plants poisonous to cats….my cat will taste everything!! My only other house plants are orchids and a small meyer lemon tree…..
Holy cow! forty years old! Good for you, Cherrie! 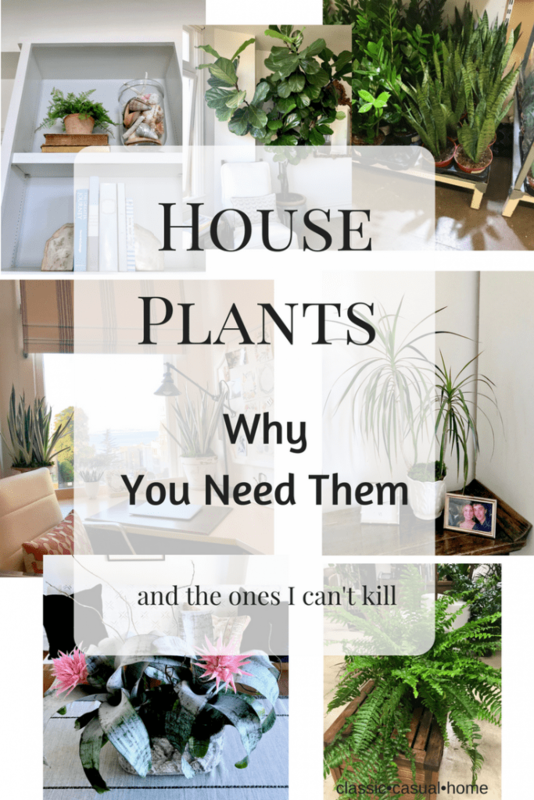 Good point about houseplants that are poisonous to cats. I worry about that a lot because my two indoor cats will chew on anything real… so I only have one houseplant right now, and when my husband sends me flowers I have to watch them like a hawk because the cats will chew on the leaves and greenery… and inevitably then throw up somewhere (usually the nearest rug– ugh. why is that?) I would dearly love to have more real plants, but do worry about the cats. Oh, your timing is perfect. I noticed some of my plants are dying because of our travelling and my having the flu and their old. I like combing the real with the unreal. I’m embarrassed to say I have some dried plants that probably should simply be thrown out. I do have a Pottery Barn nearby that I’ll check out. You simply are the perfect inspiration for the perfect time. Fresh new plants! Yes. Oh, and I like your variety. I love gardening outdoors and do so with success, but like you, I can’t seem to keep house plants alive to save my life, or theirs! However, the one exception are my 3 lovely snake plants which are so forgiving and keep on keepin’ on no matter how bad I fail them! 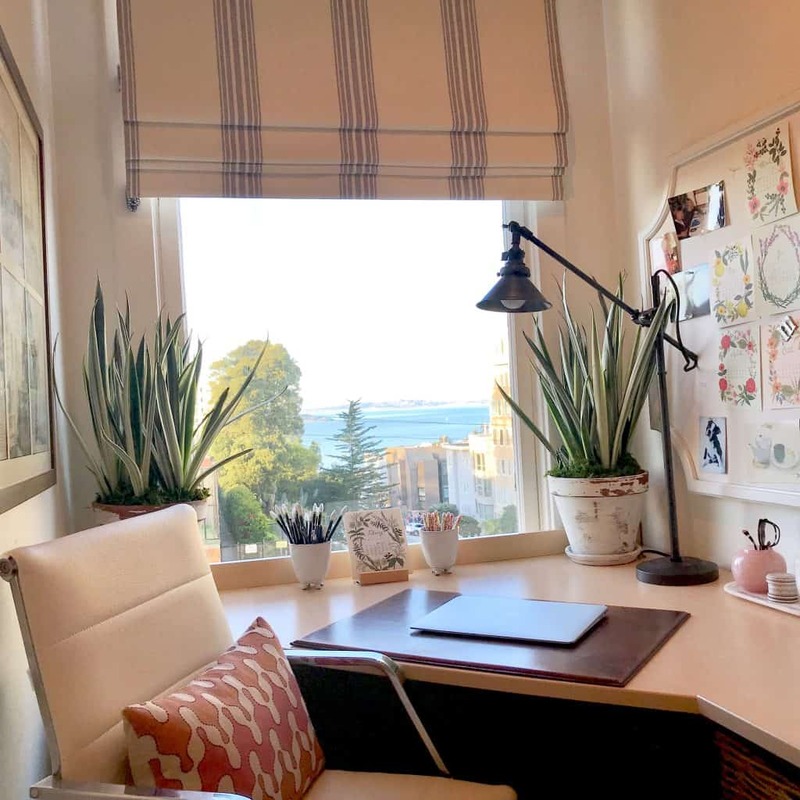 Yours look so lovely in your magnificent office with a view! 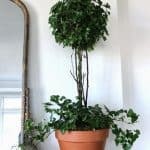 It’s funny I bought a large variegated ficus several years ago, it looked fantastic for the first month but it was a disaster, each week it would drop more and more leaves, it was in the right situation and had the right temperature, I decided it was a difficult choice never to be repeated. However, two years ago I was once again tempted, different house but similar conditions. In two years it has lost perhaps a handful of leaves, it thrives and it looks fabulous. However, the maidenhair fern your talk of has always been a disaster never to be repeated!! Yay, Susan….keeping my fingers crossed that your ficus continues to thrive!!! 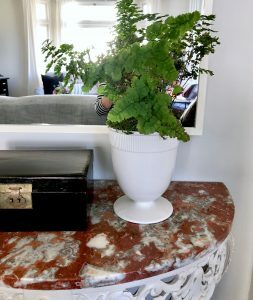 I agree about the Maidenhair Fern, to be avoided, but I always get suckered every few years I buy one. They are just so pretty. Same thing happens to me, Sally…but now that I have put it in writing I hope to stick to my guns and not buy them again. Your Fiddle Leaf Fig is so amazing and I remember it in your Newport Beach house. Have you had to repot it into a larger container? My favorite plant is the orchid. So easy and last forever. I have even gotten them to rebloom but it does take awhile. Bromeliads are another plant that lasts forever and there are many different varieties too. I have a huge pot of Maidenhair Fern outside in the shade which grows like a weed. I like to cut stems to add to small arrangements of roses. Were on earth would I PUT THEM?!!!!!!!!! You have a garden full of beautiful plants!! my snake plant was so happy where I had placed it that it bloomed!!! I had never had that happen to snake plants before! well, it turns out, I don’t like the blooms, they drip a sticky substance and are actually not that attractive… but the darn thing kept blooming so I threw it out! one of my favorite plants is the Rubber plant! Wow…hope my snake plants don’t bloom! Yes, rubber plants are hearty too! 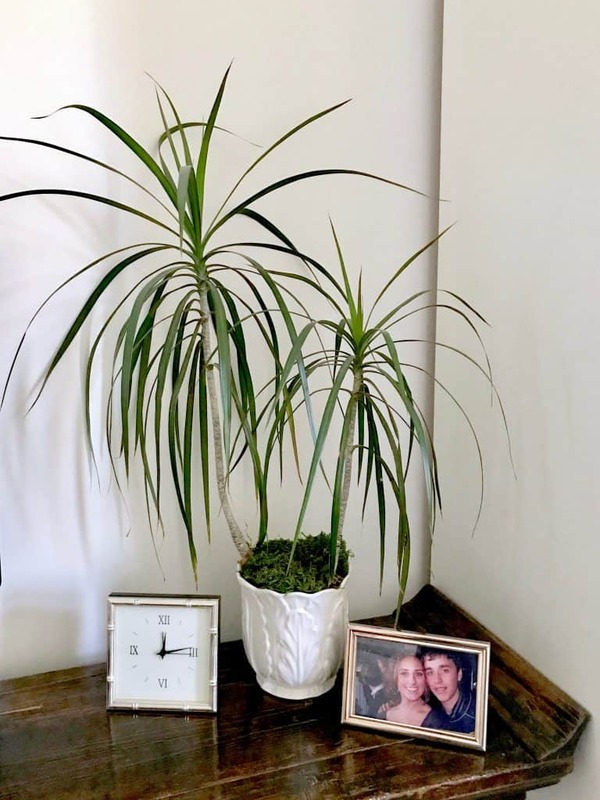 Love plants and cannot imagine my home without them, I have found palms to be super easy and they are a lot of look for the money, ditto boxwood. 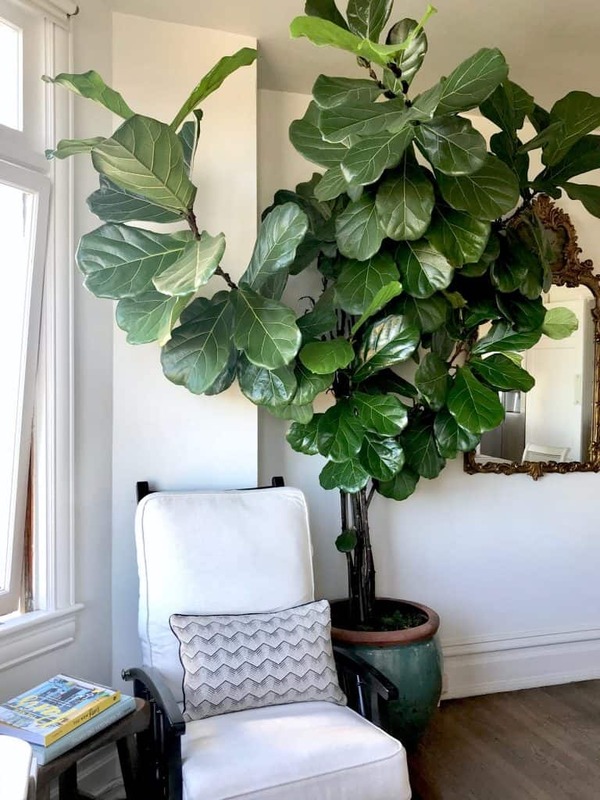 The fiddle leaf fig plant is so pretty……hope you are well Mary Ann! 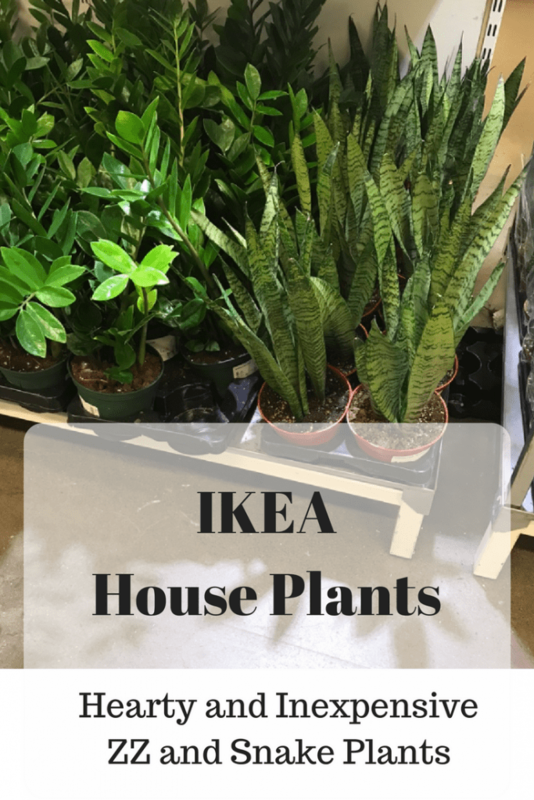 Great ideas for indoor plants! I’m starting from “scratch” since I relocated to Seattle recently. What type of store carries the moss you use? There is a link in the post to buy it on Amazon, Linda.